Make every effect special. A new interface designed especially for editors. Smart templates for making changes on the fly during editing. And easy-to-use motion graphics tools for creating eye-catching titles, transitions, and effects. 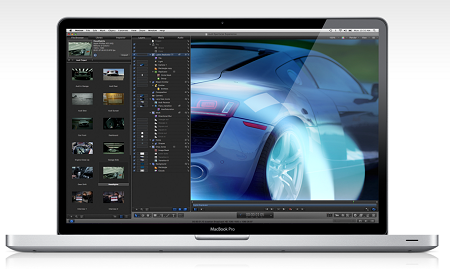 Motion is the perfect companion to Final Cut Pro. A single window. Infinite creativity. The Motion interface has been redesigned specifically for Final Cut Pro editors, with a familiar look and feel that makes it easy to switch between the two applications. The single-window layout - enhanced for the Retina display on the new Macbook Pro - puts all the tools you need at your fingertips, and redesigned icons make it easy to identify options at glance. The darker look of the interface is designed to improve color perception as you work with any combination of video, stills, and motion graphic elements. Many filters now include onscreen controls for direct, intuitive manipulation of effects. And keyframe editing is much more accessible thanks to a new view that displays the Keyframe editor below the timeline. Look great in record time. Motion features new intelligent templates that let you work quickly and flexibly with high-quality effects, titles, transitions, and generators as you edit in Final Cut Pro. Create Smart Motion Templates with any combination of single parameters and rigs, which let you control a group of parameters with a simple slider, pop-up menu, or checkbox. For titles, define fixed durations for intro and outro sections, and Final Cut Pro adjusts the title body to fit the timing in the middle. Or set up templates with multiple aspect ratios to have Final Cut Pro automatically use the correct layout based on the frame size of your footage. Publish templates to Final Cut Pro simply by saving them. Save steps when you're working with a large number of parameters. Rigs let you adjust related parameters with a single control - a slider, pop-up menu, or checkbox. For example, change the colors of all the objects in your project in one step, or apply a complicated logo to a scene with a click. Set up rigs with drag-and-drop ease and change them at any time. Because rigs let you switch quickly among options in real time, they are ideal for Smart Motion Templates used in Final Cut Pro. Final Cut Pro includes a rich content library featuring titles, transitions, effects, and generators, most of which are Smart Motion Templates. Open any of these templates in Motion for further customization, then publish your modified template to Final Cut Pro by saving it. The new template is available for use immediately. Beautiful results with a single click. Creating chroma keys has never been easier. Just drag and drop the Keying filter for an instant chroma key that is accurate for most projects. If the blue- or green-screen background is unevenly lit, or if there are other problems in the original footage, use onscreen controls and a simple slider to adjust the key color and edge softness. For additional adjustments, instantly access advanced controls, including an intuitive color wheel. Buy a Premium Account *** RAPIDGATOR.NET *** to download file with fast speed! Apple Motion v5.0.4 Mac OSX Intel Download via Hotfile Rapidshare Fileserve Megaupload & FileSonic, Apple Motion v5.0.4 Mac OSX Intel free torrent downloads included crack, serial, keygen.